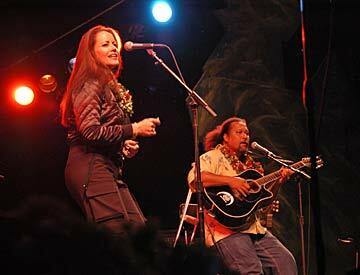 Amy Hanaiali'i Gilliom and Willie K toured the West Coast with a film crew in 2003. "Aloha Live" is an uncomplicated, easy-to-watch road documentary about Willie K and Amy Hanaiali'i Gilliom's seven-stop West Coast tour in 2003. "Aloha Live: On the Road with Willie K & Amy"
The film captures the spirit of aloha of two of Hawaii's musical stars -- guitarist, vocalist, songwriter Willie and falsetto vocalist Gilliom. It also takes viewers backstage at venues from Seattle to Las Vegas to Southern California, into band rehearsals, sound checks and on the cramped tour bus. But the documentary makes little mention of the duo's tumultuous relationship, or how they got back together for this two-week gig. Yes, they want to expose mainland audiences to Hawaiian music and record an album from the tour -- but how tough was this emotionally? That backstory would have helped turn an ordinary road film into more compelling drama. Without this drama, "Aloha Live" comes across as a self-promoting love fest among all the players. Viewers are expected to believe there were no artistic differences, emotional anxieties or the least bit of frustration. When record producer Jim Linkner calls Amy and Willie "the strongest duo in modern Hawaiian music," there's nothing to prove it. Audience reactions at most concerts are enthusiastic and Gilliom's astounding voice, smile and self-effacing comments keep the doc moving. Then right when we're feeling good about Amy et al, the filmmaker has Linkner add another unsubstantiated comment: "Amy probably at this point is the most glamorous of all the Hawaiian female artists." It's downright embarrassing. The occasional flirting and banter between Willie and Amy allows us to imagine that some feelings remain between the two. It's a missed opportunity that the subject goes nowhere. "Aloha Live" simply leads us from venue to venue, failing as drama, and certainly in exploring any mystique that surrounds the pair. Gilliom says the only difference between touring with Willie now and before is this time there's a band. Please tell me it was more exciting before.